CGI of student accommodation proposed for the University of Birmingham by Balfour Beatty. Balfour Beatty has been awarded a £42 million contract to design and build new student accommodation for the University of Birmingham. 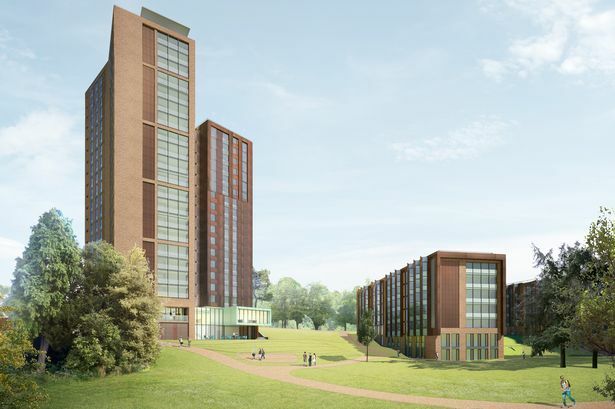 The contract to deliver the new Chamberlain Halls of residence involves the demolition and re-building of the existing Eden Tower and a new 20-storey tower, together with three ‘finger’ buildings along Church Road in Edgbaston. Construction of the block, which will provide 726 bedrooms, is scheduled for completion in the winter of 2015. Tony Dixon, managing director of construction at Balfour Beatty Construction Services UK, said: “This scheme for the University of Birmingham builds on our significant portfolio of work in the student accommodation sector. Balfour Beatty Ground Engineering will carry out piling with Balfour Beatty Engineering Services, through its Modular Systems facility in Wednesbury.